SANAA, Yemen (AP) — The head of the U.N. mission In Yemen charged with monitoring a cease-fire between rival forces in a key port city was leaving a meeting with government representatives Thursday when a U.N.-marked armored vehicle in his convoy was hit with one round of small arms fire, the spokesman for the world body said. Stephane Dujarric told reporters at U.N. headquarters in New York that “we do not have information as to the source of the fire” in the Red sea port city of Hodeida. Cammaert has been in Hodeida since late December trying to get the internationally recognized government and the Shiite rebels known as Houthis to strengthen a cease-fire negotiated in Sweden last month and agree to arrangements for the redeployment of their forces. Both the rebels and officials associated with the Saudi-led coalition fighting the Houthis alongside the government blamed the other for the shooting. A rebel spokesman, Yania Sarie, denied media reports that the rebels opened fire on Cammaert and his team. He said workers trying to remove barricades to allow Cammaert and his team to cross into the part of Hodeida controlled by government forces came under fire. Military officials linked to the coalition said it was the Houthis who opened fire on the convoy. Reports of Cammaert coming under rebel fire were broadcast by television networks owned by or loyal to Saudi Arabia and the United Arab Emirates, a key alliance member. Thursday’s incident followed criticism earlier this week on the Houthi television channel al-Masirah, which branded Cammaert as “biased” in favor of the government. Cammaert expressed disappointment at the rebels’ failure to open humanitarian corridors between Hodeida, which they control, and Sanaa, the capital. Instead, the Houthis pretended to cede control of the port to naval forces when in fact they handed over control of the facility to their fighters after they donned coast guard uniforms. The Dutch officer diplomatically called them out, saying every redeployment move must be agreed to in advance by all parties and subject to verification. 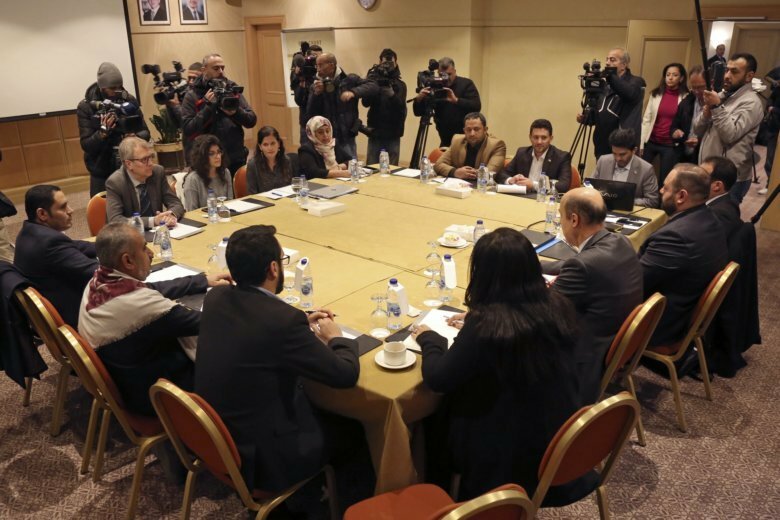 Separately, representatives of Yemen’s warring sides met in Jordan for a second day Thursday for talks on implementing a prisoner exchange also agreed to in Sweden. The office of U.N. envoy Martin Griffiths has described the two-day meeting between the rebels and the government as a “technical one.” The International Committee of the Red Cross was also attending, and a closing statement was expected later in the day. Human Rights Watch, meanwhile, urged the international community to pressure both sides to exercise restraint and stop selling weapons to Saudi Arabia, which leads a coalition fighting on the side of the Yemeni government. “Governments around the globe can either do nothing while millions sink closer toward famine or use the leverage at their disposal to press the warring parties to end their abuses and impose sanctions on those obstructing aid,” said Sarah Leah Whitson, Mideast and North Africa director at the New York-based watchdog. Yemen, the poorest Arab country, plunged into civil war in 2014, when the rebels captured the capital, Sanaa. The Saudi-led coalition intervened a year later. The fighting has taken a terrible toll on civilians, with thousands killed and a catastrophic humanitarian crisis underway. Millions suffer from food and medical care shortages and the country has been pushed to the brink of famine. In Sweden in December, the two sides agreed to confidence-building measures, including the exchange of thousands of prisoners. But the implementation of that deal has been slow and marred by violence. Lederer reported from the United Nations in New York. Associated Press writer Maggie Michael contributed to this report from Cairo.